​NovaThreads may be used as both a corrective and proactive part of your anti-aging treatment plan, just like other cosmetic injectables. 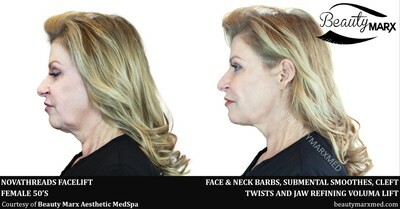 Patients with wrinkles, skin laxity, saggy jowls may all be great candidates. 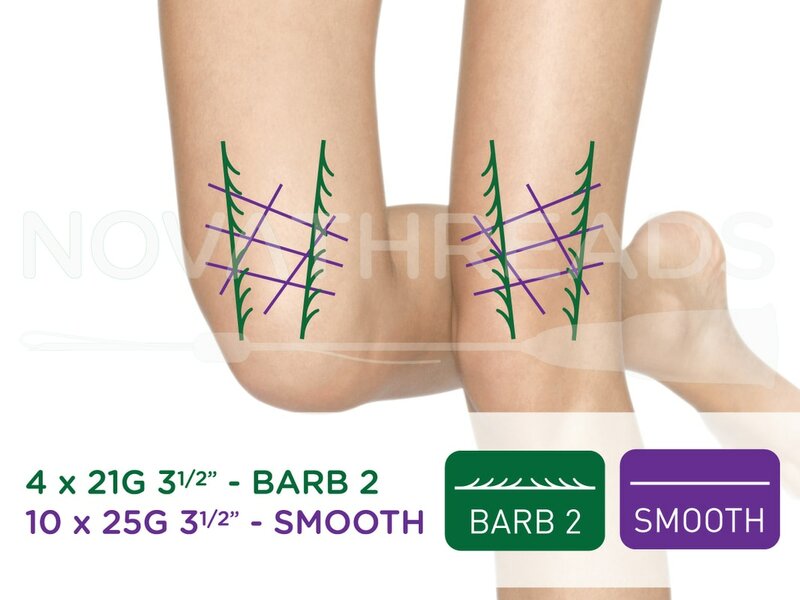 Read on to learn more about NovaThreads PDO Sutures at Beauty Marx for how they work and the variety of problem areas that they can target. 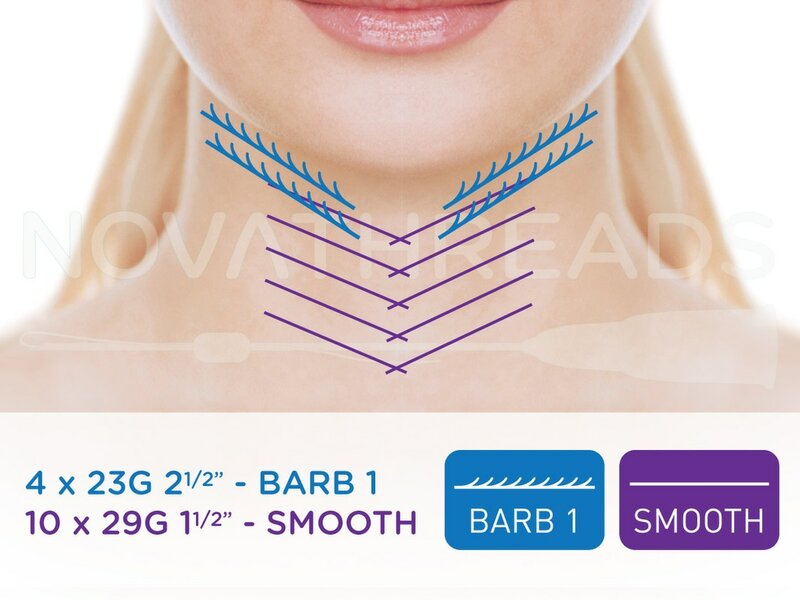 The NovaThread Barb (there are three distinctly different designs based on orientation of the barbs) is the main choice for treating folds in the skin due to effects of aging such as skin laxity or loss of tissue. It can tighten skin around the cheeks, jaw area, do brow lifts and more. After application of a local anesthetic, the suture is inserted and the deepest barbs are anchored. Next, the suture is pulled back to a desired adjustment point, cut and the opposing barbs are massaged in. The process is incredibly quick and the results you may achieve are immediate. 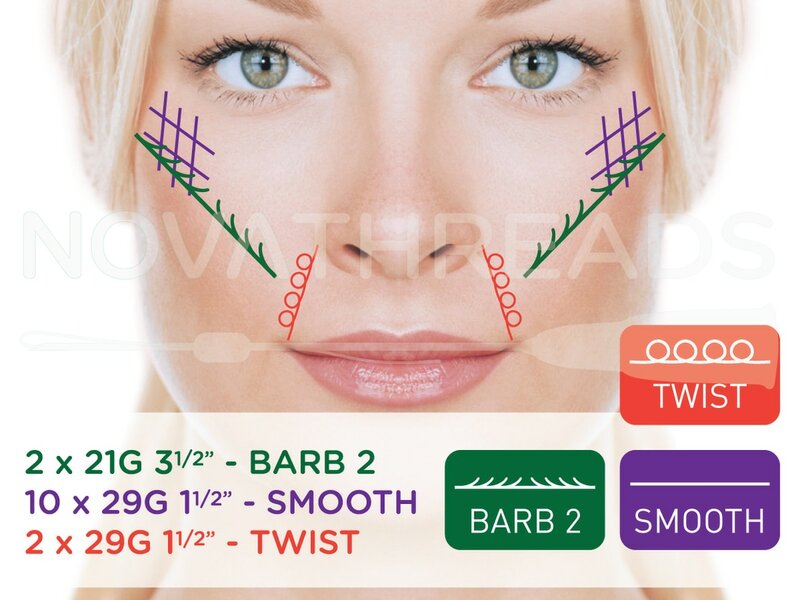 NovaThread Twists work to lift the skin, and in the right situation may produce results equal to or better than traditional injectable fillers. The twists have a firm corkscrew like shape and may be a great choice for nasal labia folds, glabellar lines (elevens) or some depressions from scarring. 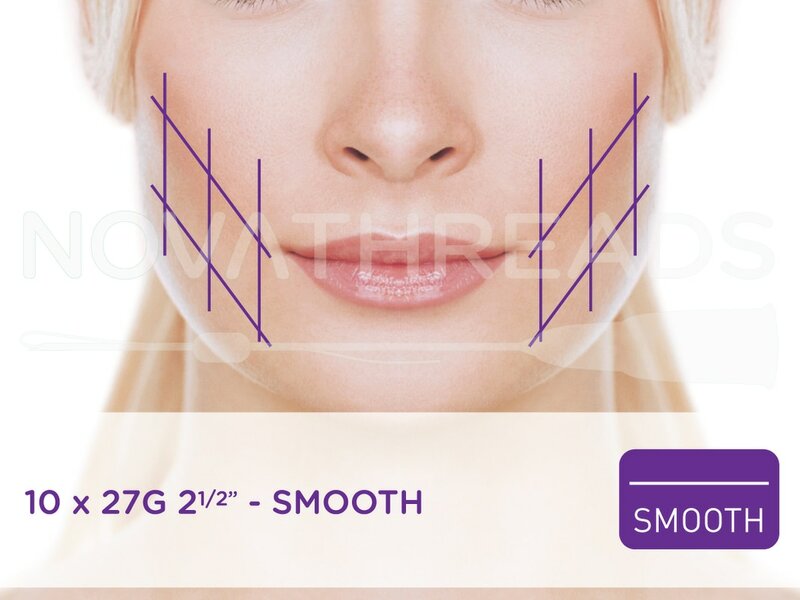 NovaThread Smooth PDO Sutures are used in problem areas that could benefit from collagen production, such as wrinkling in the face or neck, or where acne scarring is present. 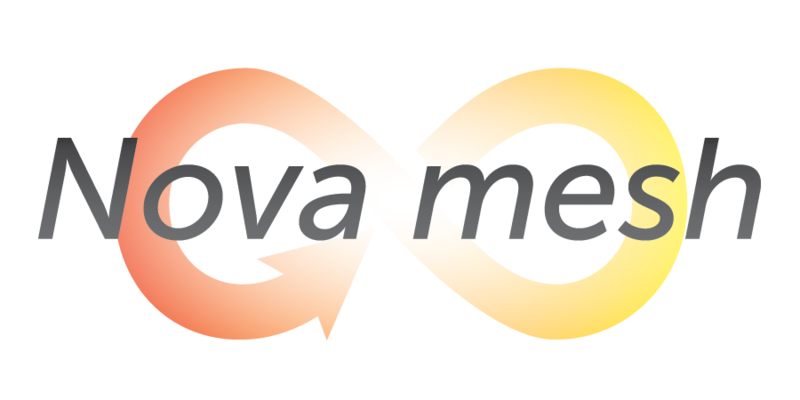 As its treatment branded name, NovaMesh, would suggest, they are typically inserted in a hashtag or net like pattern, for optimal results. NovaThreads are available in three major different forms; barbs, smooths and twists. Those different forms come in varying sizes and and lengths. 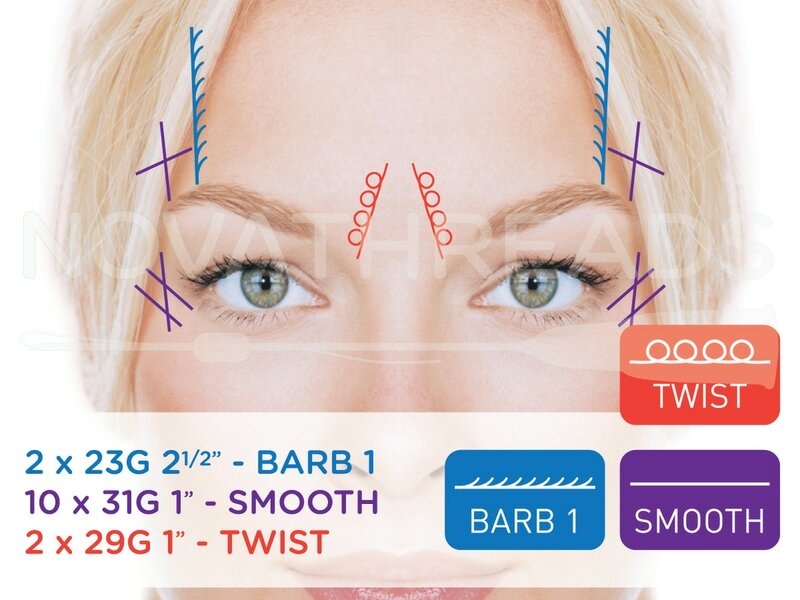 Beauty Marx will consult with you on your goals select the appropriate sutures to meet those needs. 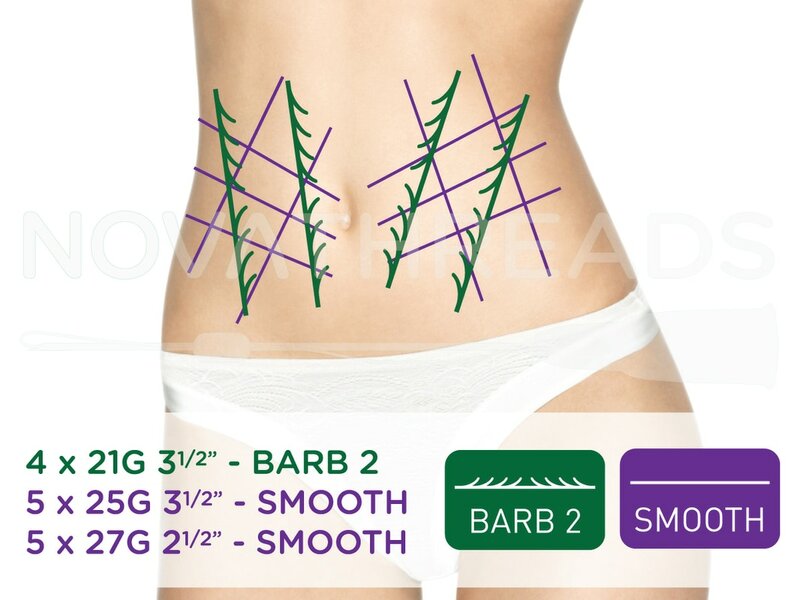 The PDO sutures are inserted subdermally into the interstitial tissue, with the aid of a hypodermic needle that has a proprietary design specific to the purpose. Depending on the type of suture, a local anesthetic may or may not be necessary. 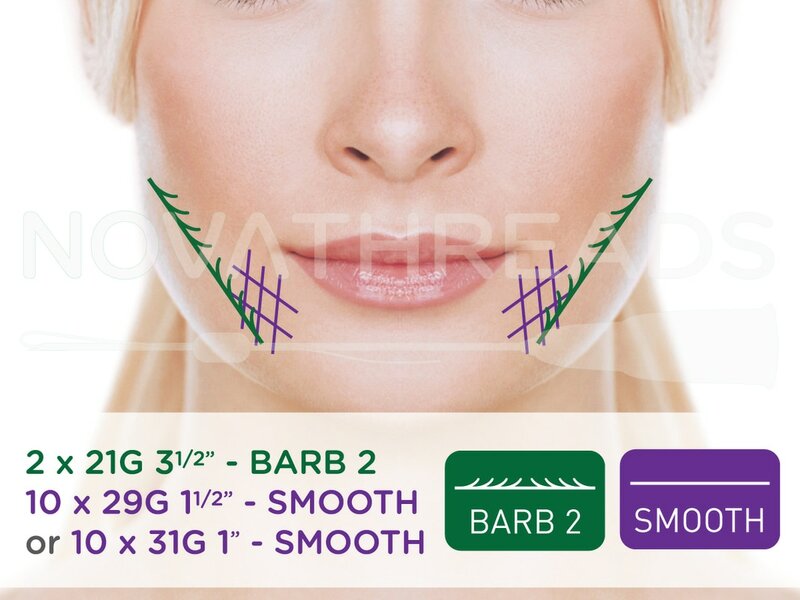 For instance, the smooths are quite small and feel similar to Botox injections but the barbs are a larger gauge and numbing will often be preferred. 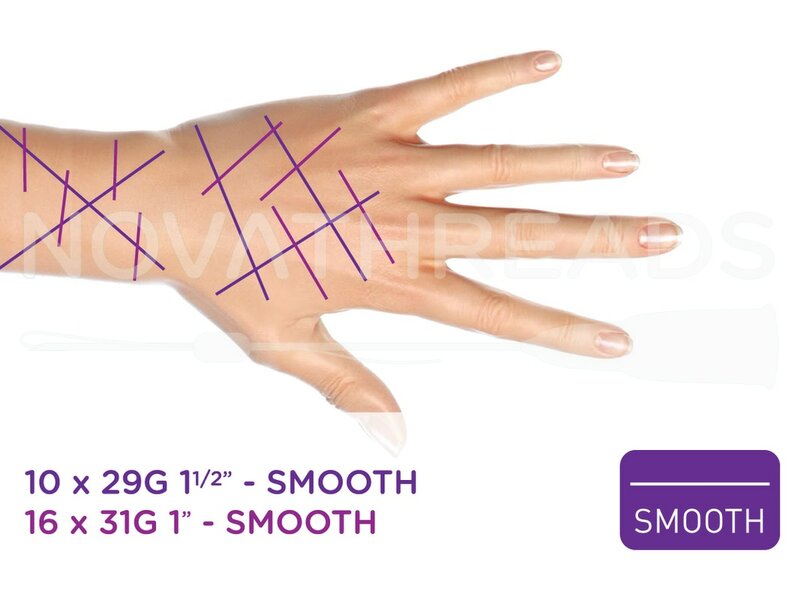 Once the injection sites and path of the needle are marked on the skin, the process is quite quick. If you've received cosmetic injectables in the past, the experience will be quite familiar. Post care instructions will be provided and are rather straight forward. 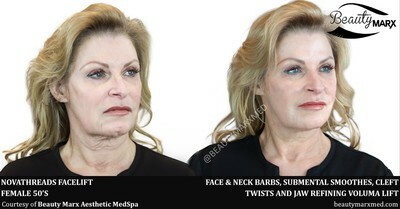 With lifts especially, they may include instructions to avoid any strenuous activity that could manifest itself in strong facial expressions for one to two weeks. 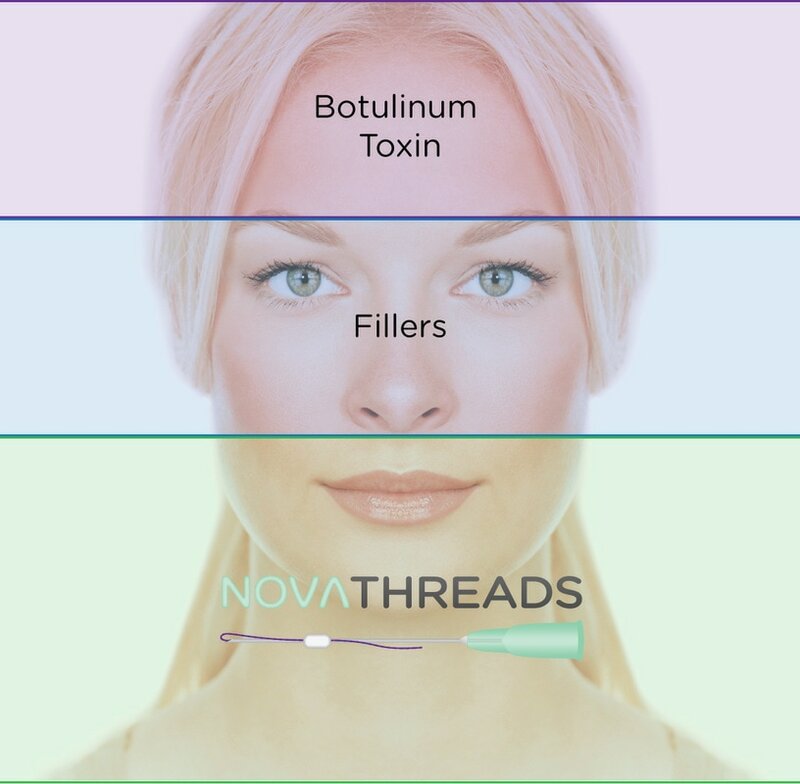 NovaThreads are inserted with a hypodermic needle, which is immediatley removed. No surgery! 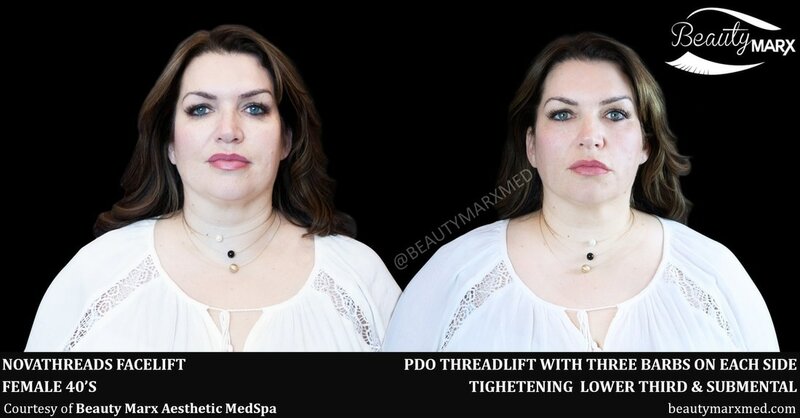 You may recall the term, Thread Lift, surfacing approximately ten years ago and related to what sounded like same treatment you're reading about here. 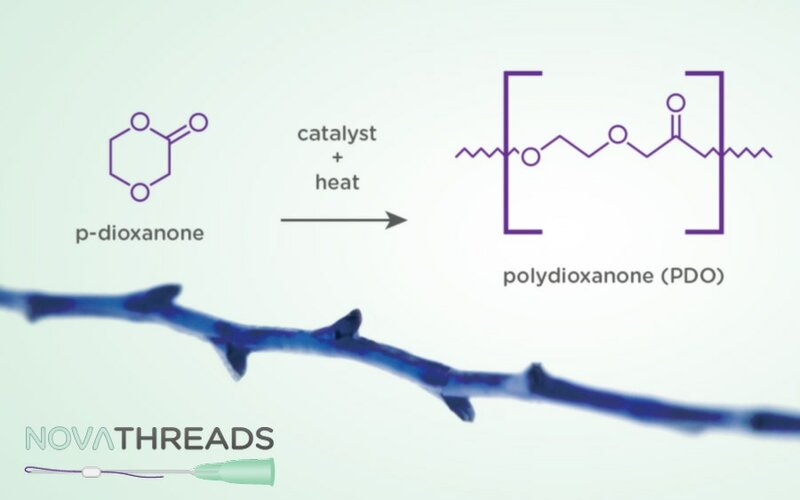 The very significant difference is that threads in the past were not absorbable, which resulted in suboptimal outcomes. 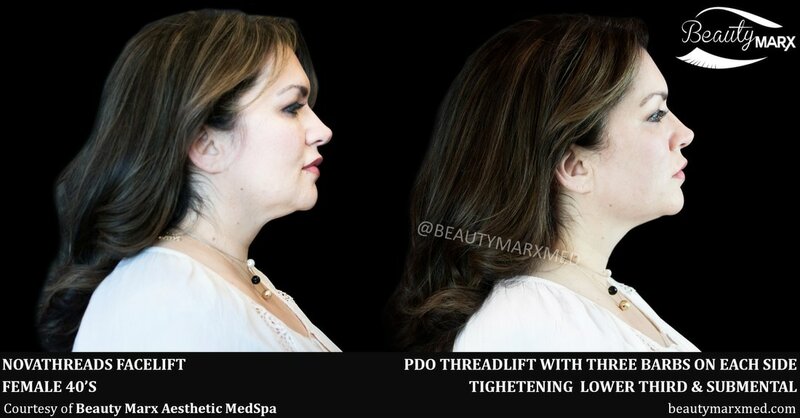 ​PDO stands for Polydioxanone, a synthetic absorbable material. 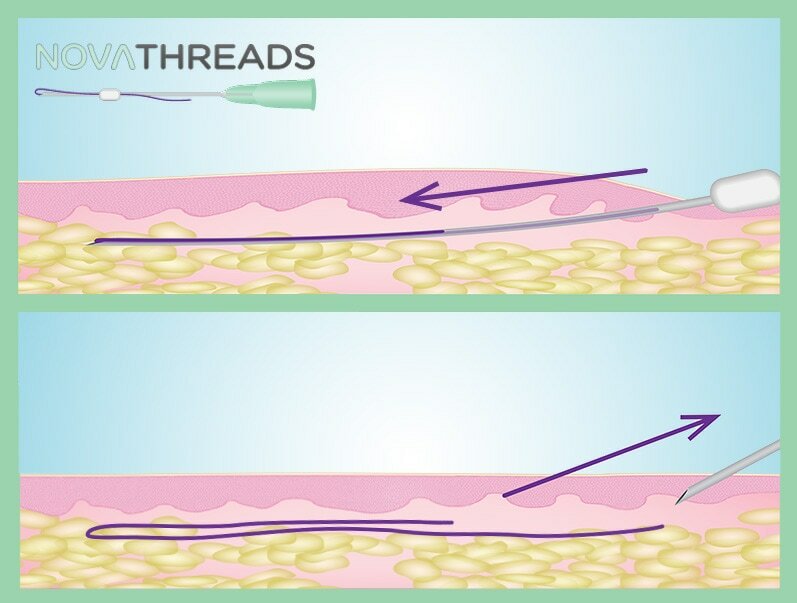 While NovaThreads are patented in their design, they have the same composition as PDO sutures that are used along with open-heart surgery, for the very reason that they are 100% absorbable by the body. They fully break down in four to six months. If they absorb so quickly, does that mean you have to come right back in for another treatment? The exciting answer to this is, NO! Just like Beauty Marx's PRP Microneedling, medical grade chemical peels and some other treatments, they initiate what is referred to as "Selective Inflammatory Response." 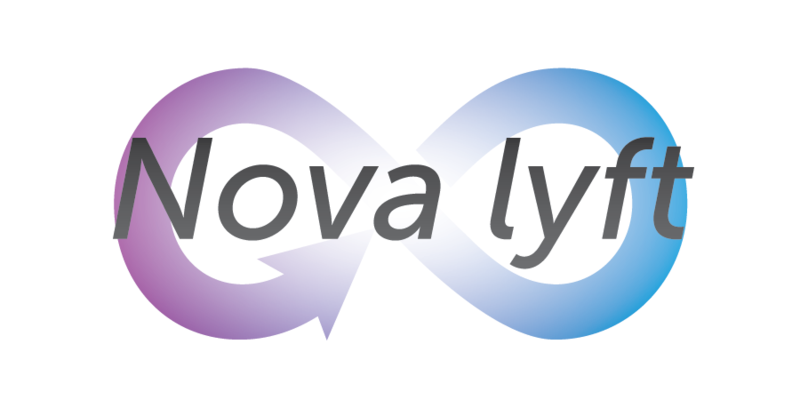 In other words, we're purposely creating an injury that the body will naturally heal, with the byproduct being new Type I Collagen but without any scar tissue. 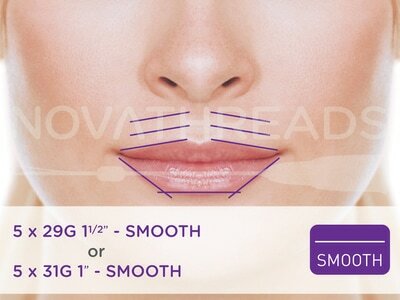 This collagen takes the place of the sutures and maintains the NovaThread treatment's intended result.